In Hillsborough county a traffic jam occurred last weekend on I-275 where construction is being done. The Tribune published their editorial Wednesday using the traffic jam to advocate for more transit options including claims that transit (rail) spurs economic development. Episodes such as these make the case for diversifying mass transit options far better than any marketing campaign. Diversifying transit presents options, many of them more affordable and more conducive to a better quality of life than being stuck in traffic for a couple of hours every day. It also spurs economic development and makes the area more attractive to visitors. Motorists need to remember delays such as these when their local leaders seek support for mass transit initiatives in the coming months. Diversifying transit options isn’t going to eliminate massive traffic jams that result from road work. So how's that logic? A traffic jam created by road construction makes the case for more diverse transit options but diversifying transit options won't eliminate traffic jams resulting from road work. Sound circular? It is. We note not nary a word from the Tribune about holding those responsible for when and how the re-route occurred causing the traffic jam. 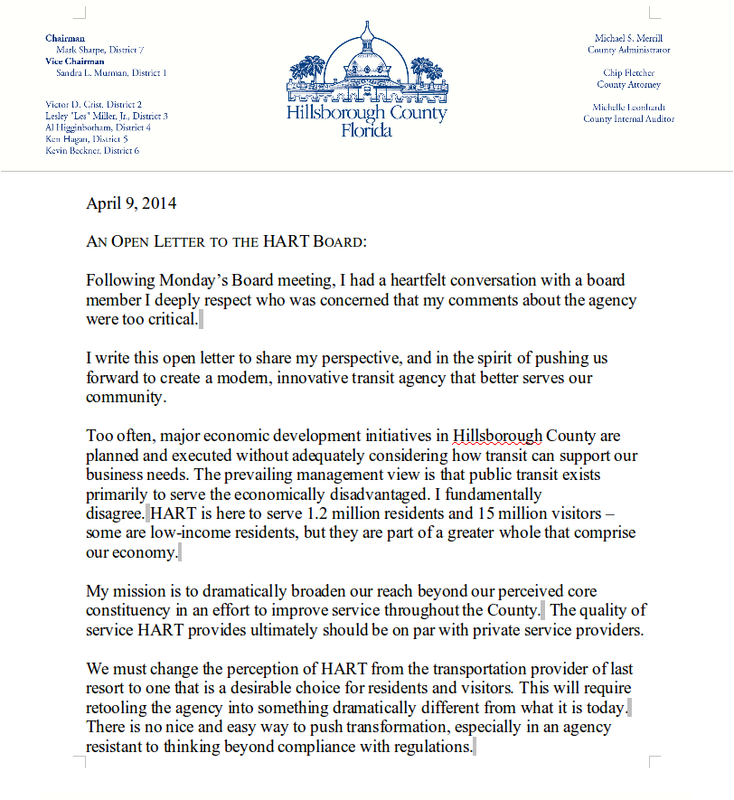 Also, coincidentally on Wednesday, County Commissioner Mark Sharpe, who also sits on the HART board sent this open letter to the HART board. Certainly there was no coordination between the Tribune editorial and the timing of Sharpe's letter. The Sunshine Law requires boards to meet in public; boards may not take action on or engage in private discussions of board business via written correspondence, e-mails, text messages or other electronic communications. See AGO 89-39 (members of a public board may not use computers to conduct private discussions among themselves about board business). Accordingly, the law is applicable to any gathering, whether formal or casual, of two or more members of the same board or commission to discuss some matter on which foreseeable action will be taken by the public board or commission. The Sunshine Law is, therefore, applicable to all functions of covered boards and commissions, whether formal or informal, which relate to the affairs and duties of the board or commission. Board members of an agency under the Sunshine Laws are not supposed to be engaging in private conversations regarding the agency. We'll let the lawyers figure out the legal aspects. There have already been some discussion at previous HART board meetings about a proposal to restructure HART into some type of super-sized agency responsible for roads, transit and economic development. This issue will come up again at HART. This restructuring of HART proposal will be a topic for a post another day but HART does not oversee road improvements nor have responsibility for economic development today. A transit agency should not be responsible for economic development. We already have the Economic Development Corporation (EDC), Tampa Bay Partnership, MPO's, Chambers of Commerce, Tampa Bay Regional Planning Council, the Planning Commission and the county commissioners themselves (there's probably more) responsible for some aspect of land use and economic development. Commissioner Sharpe is a board member of both the EDC and Tampa Bay Partnership and is chairman of the Hillsborough MPO. To digress, as we posted here, these entities should be focusing on recruiting corporate and regional headquarters not wasting so much of their time and energy on wanting to develop around train stations or baseball stadiums. Commissioner Sharpe, who chairs the Hillsborough County Commission, sits on the HART board and is a participant on the county's Transportation Leadership Policy Group. From his comments at the Transportation Leadership Policy Group meetings, he is a proponent of this super-sized, super-charged restructured HART. However, Sharpe's open letter appears to be an emotional plea rather than a rational, focused and measured response to something. The quality of service HART provides ultimately should be on par with private service providers. Sharpe wants to "transform" HART? Transform to what? No details were provided. HART does not need transforming to provide quality, cost-effective service for those who need or want to use their services. HART does not need to be transformed to continue improving their bus services. Is it the role of government for taxpayers to provide services "on par" with private sector providers? How much will that cost taxpayers? Is that realistically doable since innovation is constantly occurring in the private sector? The fare box revenue of our bus service in Hillsborough County is about 25% of the operating costs, meaning taxpayers pick up subsidizing about 75% of the costs. If Sharpe wants to transform HART to be like private service providers, then doesn't the discussion need to include market based fares? If Sharpe wants more people to ride transit, then why shouldn't those riders pay their "fare share" at the fare box to recover transit's costs. Why should taxpayers highly subsidize those with higher incomes to take transit? What about privatization or out-sourcing? Are those part of the "transformation" discussion? “Our core mission is to provide transportation for those who otherwise don’t have private transportation,” she said. The lower income who depend on the bus service to get to their jobs or those who cannot drive and need public transit are often hurt when transit systems are "transformed" to over extending themselves with high cost rail systems. There are too many instances of bus services being cut or the bus service expansion promised cannot occur because of the high cost of operating a rail. The role of government is to provide a safety net of quality public transit services for the those who need the service not force taxpayers to pay for transit options that costs too much, benefits too few and does nothing about congestion. Reality is most of (98%) drive. The elephant in the room is COST. With no details or specifics in Sharpe's letter, no one knows. Where is the money coming from and who is going to pay? Who will benefit? The federal transportation dollars are dwindling and they come with all kinds of strings attached. We are over $17.5 TRILLION in debt. We have gotten into our fiscal mess pursuing grandiose ideas, even with good intentions, that then become a fiscal disaster and put taxpayers at risk and on the hook at the benefit of a few. We appreciate Commissioner Sharpe's enthusiasm for transit. However, the most critical transportation issue in Hillsborough is lack of road funding. Buses need roads. Hillsborough county is a large county over 1100 square miles and there are unmet transportation needs that we need NOW or in the very near future not 12-15 years from now. Let's also get rid of the PTC and it's burdensome regulations so that the new innovative, on-demand ride sharing services can operate and compete in Hillsborough County. We live in a highly mobile and on-demand society today. New car and ride sharing services can provide a transportation alternative when and where you need it at the touch of an App on your smartphone or tablet. Perhaps when Sharpe leaves office in November, he'll continue his passion for the transportation issue pursuing private sector transportation solutions. 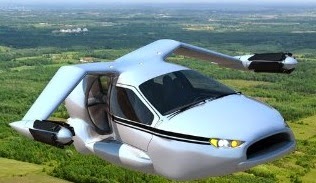 that can do vertical take-offs and landings. Transportation innovation is occurring in the private sector where it should occur. We may not only have autonomous vehicles but perhaps we'll finally be like the Jetson's and we'll be driving flying cars too. When I go to Orlando, there is little to no sense, that the public transit system is to serve the lowest common denominator. They market to the tourist. Tourism is job one in Florida. It has been my proposal, for over four years, that Tampa Bay, offer ONE premium priced payment card, that allows all access, to all non-profit museums, and all mass transit options, I call this magnetic swipe card: THEMEPARK TAMPA. Other cities around the world have offerred this option for great success. The main reason to offer this, is to TRANSFORM, the transit system from the lowest common denominator, to the central driver of our economy - TOURISM. Mark Sharpe can mask what he says any way he wants, his ultimate goal is light rail to connect Tampa Temple Terrace and TIA. If his goal were to "transform" HART into a world class transit system, he would be advocating CNG busses and lots of them. HART has 200 busses to service a community ( Hillsborough County, not just Tampa/Temple Terrace) of 1,277,746 plus people. In comparison, Salt Lake County's UTA has 650 plus busses to service a community of 1,081,849 plus people. It is Salt Lake County's bus fleet and their "good traffic flow" that makes its transit system succeed not the recently added limited light rail system.